NEW YORK, NY--(Marketwired - Jan 13, 2014) - HP (NYSE: HPQ) today expanded its market-leading retail solutions portfolio with an enhanced line of touch and non-touch digital signage displays (DSDs), a new line of value-priced displays and upgrades to its mobile and fixed point of sale (POS) solutions. Today's announcements at the National Retail Federation (NRF) Convention & Expo include six new DSDs to help retailers increase customer engagement with interactive digital experiences, as well as additions to the HP RP7 Retail System which help retailers better service customers in the store. HP also will be showcasing the HP MX10 Retail Solution,(1) which gives retailers the flexibility to better meet customers' needs with the ability to transition between a mobile and fixed point-of-sale (POS) solution. "Consumer expectations are rapidly changing as online and mobile shopping continues to grow," said Ray Carlin, vice president and general manager, Retail Solutions, HP. "HP's wide range of customizable solutions will help businesses of any size navigate this new retail environment and deliver a seamless customer experience." The new portfolio of DSDs has been redesigned with thin, light LED backlights and professional front-of-screen features with 178-degree viewing angles, so retailers can showcase their messages anywhere in the store. HP's new line of performance, touch-enabled and value-priced displays help retailers improve the in-store experience and customer engagement with features like automated content updating and the ability to display content in multiple languages. Touch-enabled displays: HP's touchscreen DSDs -- including the 42-inch diagonal HP LD4245tm and 47-inch diagonal HP LD4745tm -- benefit businesses looking for a platform that provides increased interaction with customers. The displays also offer Full High-definition (FHD)(2) quality resolution and feature Integrated Infrared (IR) multitouch capabilities, adding another way for retailers to interact with customers in the store. Retailers also benefit from reduced power consumption and lower costs with mercury-free display backlights, low-halogen components(3) and arsenic-free display glass. Performance displays: HP's high-end commercial-grade LED backlit displays -- including the 42-inch diagonal HP LD4235 and 47-inch diagonal HP LD4735 -- provide retailers with reliable customer experiences that maximize engagement and efficiency through 24-hour operation. Professional-grade features -- including networked management to enable efficient control by IT staff, lock-out features to prevent tampering, Video-over-Ethernet (VoE) for simplified cabling and a built-in basic USB media player -- help retailers improve in-store ambience with minimal effort. Value-priced displays: HP's value-priced LED backlit DSDs -- including the 31.5-inch diagonal HP B321 and 42-inch diagonal HP B421 -- are fit for customers seeking essential features at a lower cost. Built for extended daily operation, these displays provide a slim, sleek design and value-added features include a built-in USB media player and streaming networked video support. The HP LD4245tm and HP LD4745tm are expected to be available in North America, Asia Pacific and select Latin American countries in March, and in Europe, the Middle East and Africa in April. Pricing is available upon request. The HP LD4235 and the HP LD4735 are expected to be available in North America, Latin America and Asia Pacific in February. Pricing is available upon request. The HP B321 and HP B421 are expected to be available in North America and select countries in Latin America and Asia Pacific this month. Pricing is available upon request. The HP RP7 Retail System is available worldwide now. The Windows 8.1 Professional and Windows Embedded 8.1 Industry for HP RP7 Retail System, Model 7800 will be available at the end of January. Pricing is available upon request. The HP MX10 Retail Solution is expected to be available later this month. Pricing is available upon request. HP's new retail solutions will be demonstrated at booth No. 2439 at NRF in New York, today through Jan. 15. (1) The integrated display resolution of this system is below the threshold for snapping apps, a new feature that allows two Windows apps to be viewed simultaneously side by side. This feature may be enabled by attaching an external display that supports a screen resolution of 1,366 x 768 or higher. (2) Full High-definition (FHD) content is required to view HD images. (3) External power supplies, power cords, cables and peripherals are not Low Halogen. Service parts obtained after purchase may not be Low Halogen. Microsoft and Windows are U.S. registered trademarks of the Microsoft group of companies. HP’s new digital signage displays benefit businesses looking to provide customer interaction. 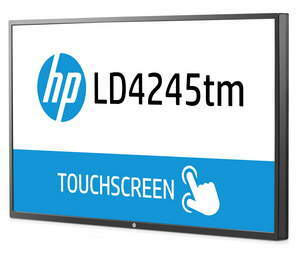 HP offers a broad range in size and price of digital signage displays from value displays to a 47-inch touch display.